Closet doors are often an afterthought when decorating a bedroom. Typically, they are white standard hinged or sliding doors comprised of either metal or wood. However, with a few simple materials and some creativity, you can transform your drab closet doors into fun, fab accent pieces. Closet doors can enhance the overall look of your bedroom. Instead of using a standard closet door, attach a curtain rod above the closet opening and hang different-colored fabrics from it to fill the space. Give the appearance that the closet is actually a large window by using regular curtains or vertical blinds. Beaded curtains, either jeweled or wood, can also serve as closet doors. Create a one-of-a-kind look by adhering wallpaper to existing closet doors. If you want to camouflage the doors, use the same type of wallpaper that's on the rests of the walls of the room. To create the appearance of framed artwork, attach large pieces of patterned wallpaper in the center of the doors. Create patchwork closet doors by using squares of different wallpaper patterns. 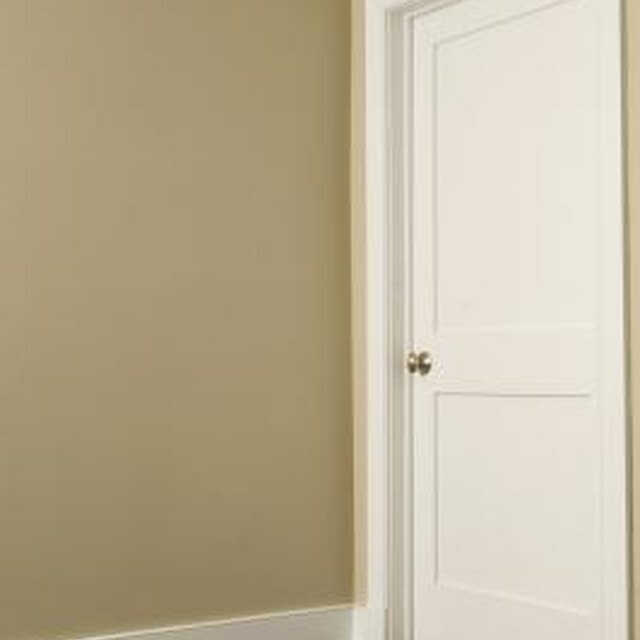 Aside from painting the closet doors a solid color, you can paint stripes on them or alternate colors from door to door for a color-blocking effect. To paint an image or silhouette on them, use a projector to project the image where you want it, then trace it lightly with a pencil before painting it on. Transform closet doors into message centers or canvases by making them into chalkboards or dry-erase boards. Use chalkboard or dry-erase spray paint to turn the doors into writing or drawing surfaces in no time. This is a great idea for kids and creative types. Add a personal touch to closet doors by turning them into large picture frames. Create a collage of your favorite photos and adhere them to the surface of the door. Seal them on with a clear acrylic spray. Based in South Florida, Leann Harms has been writing since 2008. Her design, technology, business and entertainment articles have appeared in "Design Trade" magazine and Web sites including eHow. Harms has a Bachelor of Arts in English from Florida Atlantic University. How Can I Make My Front Door Look Rustic?